In the above photo, the courthouse is shown as it appears from Second Street in Smithfield. 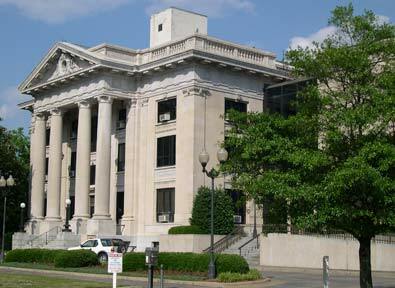 The main entrance to the Johnston County Courthouse is located at the corner of Second and Market Streets in downtown Smithfield. The courthouse actually takes up most of a city block, and it can be accessed from all four streets that surround it. These streets are Market Street, Second Street, Johnston Street, and Third Street. The main entrance for courtroom visitors is from Second Street. There is a parking lot across from the courthouse on Second Street. From Clayton and I-70 East: Follow Route 70 East, when it splits into 70-Bypass and 70-Business, follow 70-Business into Smithfield. The courthouse is on the right hand side at the corner of Second Street. From I-95: Take Exit 95 for downtown Smithfield. Head West through Smithfield. The courthouse will be on the left at the corner of Second Street.